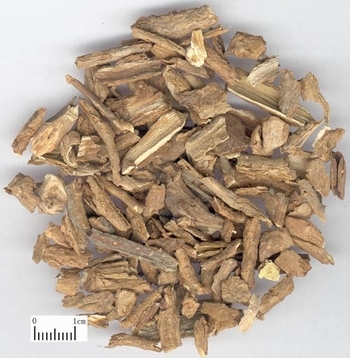 The root bark of Lycium chinense Mill or Ningxia L. barbarum L. of family Arbustum. Collected in early spring and the end of autumn. Light smell, slightly sweet with bitter after-taste. Thick peel and full pulp, regularity without wood and pieces. Sweet, slightly bitter, cold; liver, kidney and lung meridians entered. Clear deficiency heat, clear lung fire, cool blood. It is effective in clearing deficiency heat in liver and kidney, relieving bone-steaming with sweat, so it is the good herb for reducing deficiency heat and relieving tidal fever. It is often combined with yin-nourishing herbs to take effects of treating both fundamental and incidental aspects, such as Zhi Mu and Bie Jia in Di Gu Pi Tang from Sheng Ji Zong Lu. For syndrome of yin deficiency and internal heat, body fluid consumption manifested as diabetes, polydipsia, irritable feverish sensation and dry mouth, it is combined with heat-clearing and yin-nourishing herbs which excel at promoting body fluid and relieving thirst, for example, Mai Dong, Tian Hua Fen, Lu Gen and so on in Di Gu Pi Tang recorded in Sheng Ji Zong Lu. For toothache due to up-flaming of deficiency fire, it can be used singly to rinse the mouth, or fill the pulp cavity or combined with yin-nourishing and stomach-heat-clearing herbs for oral administration. It excels at clearing lung heat, reducing the latent fire in lung, and commonly indicated for treating failure of lung in purification, failure of adverse qi to descend caused by lung fire accumulation and stagnation manifested as cough or asthma. It is often combined with lung-heat-clearing and cough-stopping herbs, such as Sang Bai Pi and Gan Cao in Xie Bai San from Xiao Er Yao Zheng Zhi Jue. For cough and asthma with profuse phlegm due to lung heat, it is also combined with heat-clearing and phlegm-resolving herbs. For example, Gua Lou Ren, Jie Geng and so on in Jia Wei Xie Bai San recorded in Zheng Yin Mai Zhi. With actions of heat-clearing and blood-cooling for stopping bleeding, it is commonly indicated for hematemesis, apostaxis and hemoptysis due to blood heat. For blood stranguria, it can be decocted with alcohol such as Di Gu Pi in the book Jing Yan Guang Ji (Widely Collection of Experience). For hematemesis and hematockezia, it can be combined with Gou Qi Zi from the book Pu Ji Fang. Furthermore, its effects will be reinforced when being combined with blood-cooling and bleed-stopping herbs.